View from the parking lot, lightly screened against casual viewing from street by old fence boards. View back toward the ‘plex. 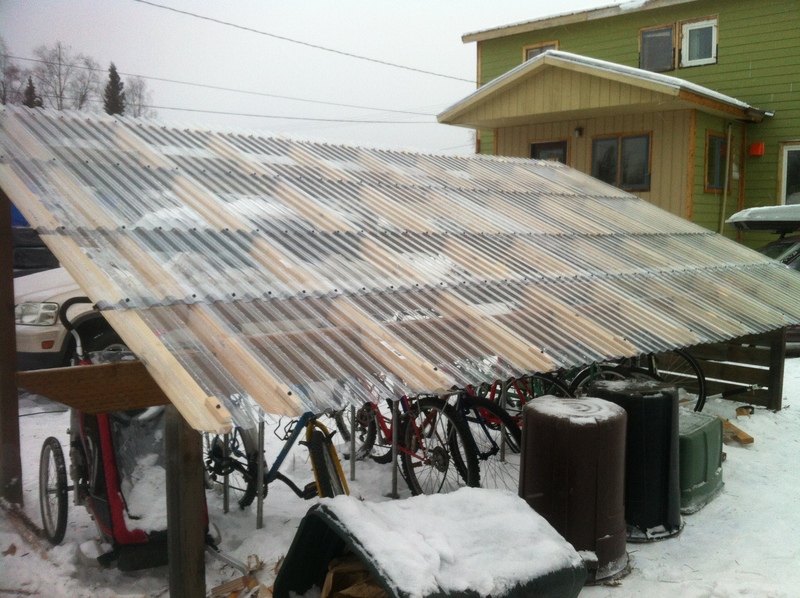 Polycarbonate roofing panels to keep the snow and rain off, let light in and through! 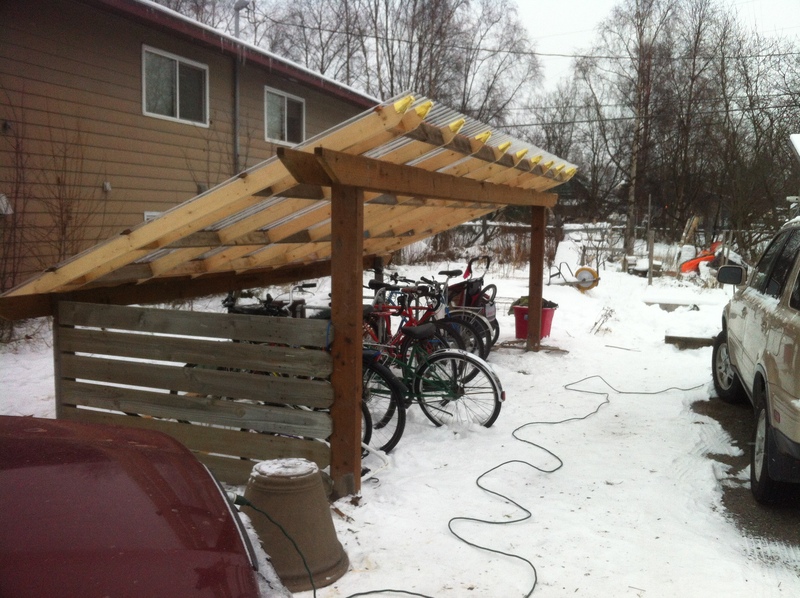 Basic covered structure is: Treated 4×4 and 4×6 corner posts for a shed roof (salvaged from a fence I am tearing down and other sources). Back 2 posts are the 4×4’s buried about a foot in concrete, sticking up 3 feet. Front 2 are 4×6’s buried about 2 feet in concrete, sticking up 6 feet. Treated 2×6’s are bolted across the front and back posts (2 in front, 1 in back – but could have just used 1 in each location). Approximate floor space dimensions are 8 feet deep by 16 feet long. 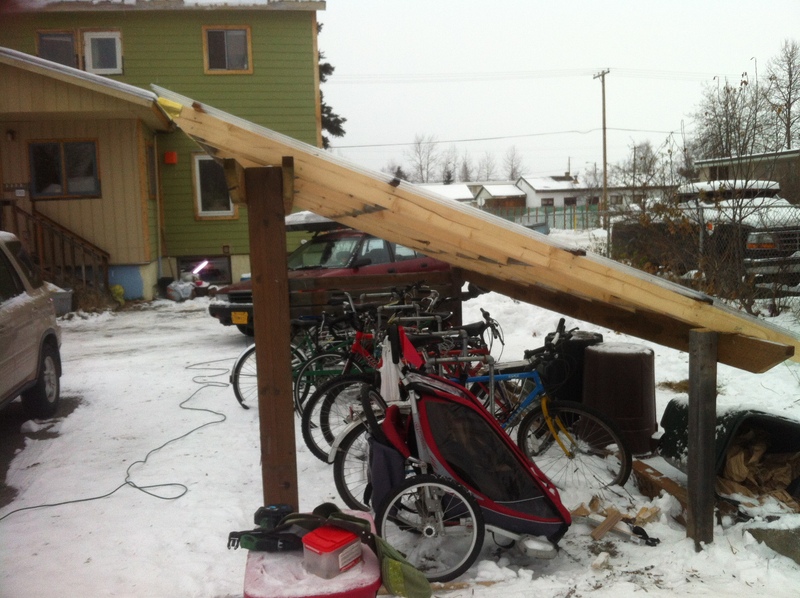 10′ 2×4’s are the rafters, spaced every 2′ with salvaged 2×4 blocking at least every 3′ along the rafters to support the polycarbonate 2’x8′ roofing panels (partial panels finish off the 10′ run of the rafters). Some brass sheeting left over from something was bent to cap each of the upper rafter ends. 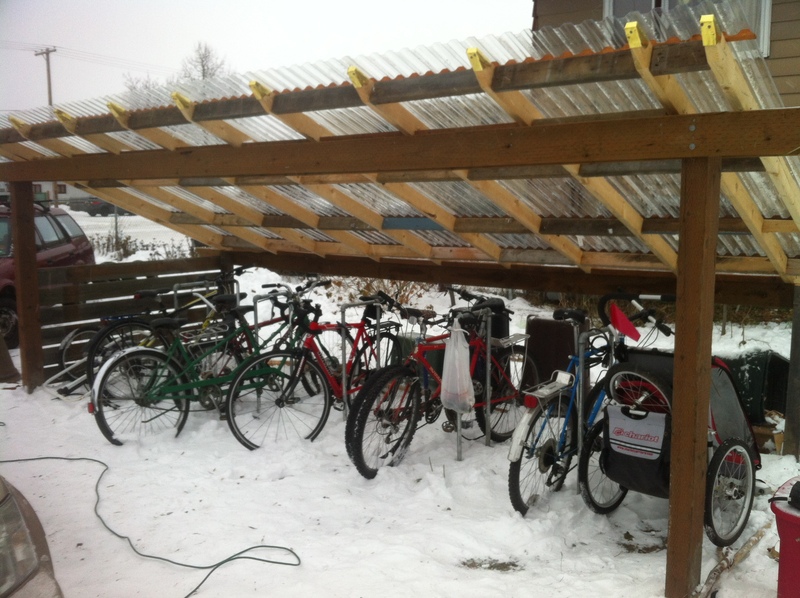 For the bike racks themselves: 5 inverted ‘U’ shaped racks were made from 1.5″ galvanized steel pipe and 90degree elbows. The U’s (or n’s) are 5′ long but 2′ is buried in concrete in the ground with 3′ sticking up. They are 1′ wide and spaced approx. 3′ from each other (as per city of Boston recommendations I found online). A bike can be locked to each side of each inverted U, for an easy 10 bikes, with plenty of space in between to avoid locking peddles and handlebars. enough 50lb sacks of ready-mix concrete for use in setting posts. This was fun because you don’t have to premix with water – you just pour in your hole around the post, spraying with water every 1/3 fill or so. I think it took somewhere around 15 bags? That’s the problem with delayed blogging and lax record keeping! Last but not least – the invaluable help of my friends and fellow ecoplexetarians! Thanks everyone!